Ted re-lives his glory days in Louise’s painting. 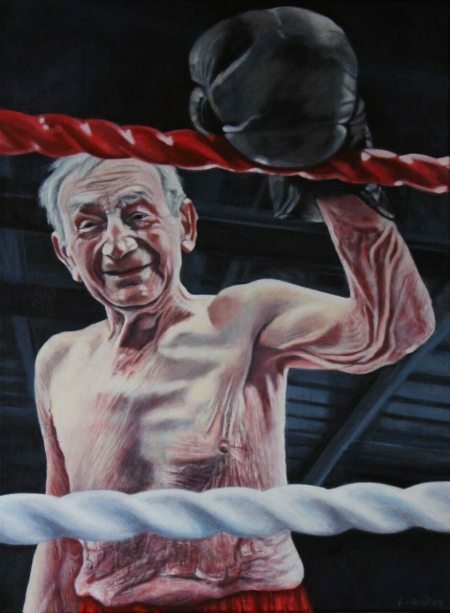 A standout painting at Artcatchers TRADITIONS Exhibition which opens this week at the Art Pavilion in Mile End Park is Louise Gridley’s portrait of Geezer Ted Lewis, who in his younger days was a champion boxer. TRADITIONS runs daily at the Art Pavilion in Mile End Park from 12.00 – 6.00 from the 1st to 19th February with an opening launch event on Thursday February 2nd, from 6.00-900. This is Louise’s third piece of work with the Geezers which first saw her produce the stunning Last Supper portrait of the guys. 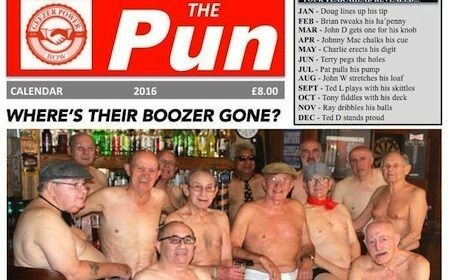 She then went on to work with them to produce last years Bare-It-All calendar THE PUN in aid of their Where’s My Boozer Gone? campaign to save local pubs in the area. Ted has always been a stalwart of the local community in Bow. 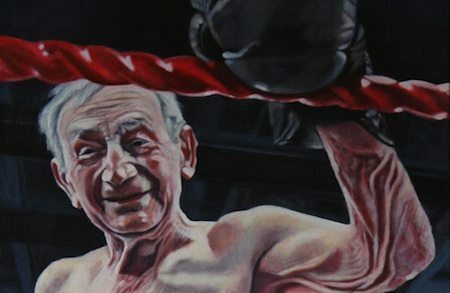 He worked as a porter in Billingsgate Fish Market all his life, but was also a boxer, photographer, poet, and in later years one of the great storytellers in the area, a skill he used on a regular basis with visiting schoolchildren at the Ragged School Museum. going to Kent each year on that traditional East End Holiday- Hop Picking. Next Post:Urgent! Sign the Petition on the Roman Road Tomorrow! Well done Ted an original Steward of the Geezers Club.